Where can you get good Hawaiian food in the Metro? Ono Burgers and Barbeque! Ono Burgers and Barbeque is the newest restaurant venture of Brick Oven Group Inc. Although this particular restaurant is new to the scene, Brick Oven Group Inc. is not. 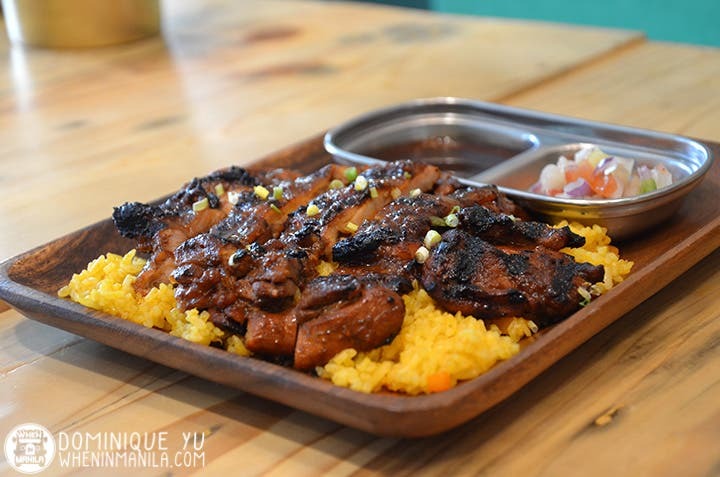 They’ve opened some of our favorite eateries in Manila including Mazza (Persian-inspired menu), Galo (Latin food), and more recently, Cobalabamba!, a fun, young Mexican joint that sits right next to Ono. Because Ono currently doesn’t serve alcohol, most people just order food from them and take it to Cobalabamba! to enjoy some cocktails with it. That totally works; feel free to cross-order from these two sister restaurants if you feel like mixing and matching tastes for the night. Ono is chill. Incorporating the vibe of surfer dudes and beach babes from Hawaii with jute rope and fairy light decorations, abaca light shades, and mint green palettes; Ono is the kind of place you can go to if you want some good kwentuhan before heading to Cobalabamba! for something more exciting. That’s not to say it’s boring – not at all. The food in itself is exciting: all-fried goodness, a melange of Hawaiian and Filipino tastes brought together into a wonderful marriage. We start out with onion rings that come with a side of sriracha aioli. As my friend continuously said throughout our meal: “the batter is so good”. And it is. I’m not really a fan of onion rings, but these were amazing – crunchy and delicious without being too salty. It’s also pretty sulit considering the size. It comes on a long wooden plate that’s about a foot long just filled with onion rings laying atop the other. Got you drooling? Same. Our next appetizer? Bacon chips. Yes, these are as sinful as you can imagine, yet is still one of Ono’s unabashed bestsellers. Crunchy and tangy (thanks to the spicy vinegar mix that comes with it), they are the perfect pika-pika for when you’re feeling snacky. There’s nothing wrong with indulging in some deep-fried bacon once in a while! You deserve it. 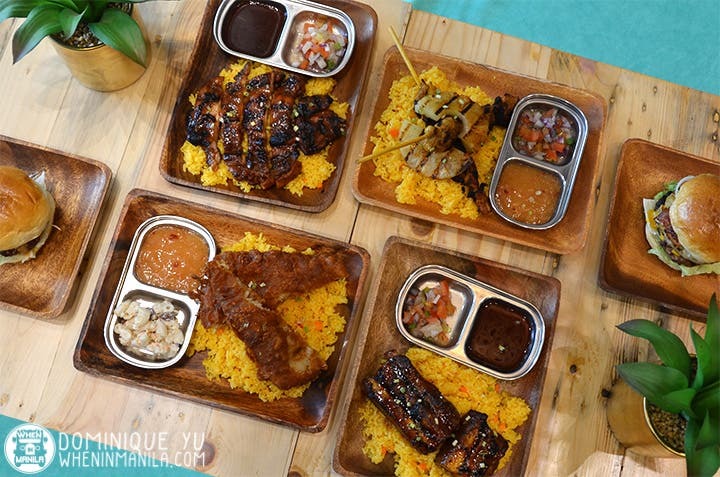 Spot the Lemongrass Chicken Skewers (Php180) and Pork Belly Ribs (Php310)! A plate of lemongrass chicken skewers came to our table soon – two sticks of chicken cutlets atop a bed of delicious Hawaiian rice. This, my friends, is what you call a classic, and a definite no-fail option if you’re feeling indecisive about what to get. The pork belly ribs are also a hit. Slabs of slow cooked pork belly are served with Hawaiian rice and the restaurant’s signature macaroni salad. The best thing about this is that the cuts of pork they use aren’t overpowered by fat. Ono makes it a point to serve you meat with just enough of that sinful good stuff (fat), so that a bite into it is perfectly balanced and tastes simply wonderful. The Maui fish fillet is another one of our favorites. It uses the same delicious batter as the onion rings, but this time wrapped around a fish cutlet and served with macaroni salad and tropical pineapple sauce. There aren’t a lot of words to describe what it’s like to bite into the Maui fish fillet, but I can tell you that “satisfying” is definitely part of the list. My personal favorite is the Huli Huli Chicken. I grabbed that plate of Huli Huli Chicken and devoured it in 15 minutes. It involves a grilled, boneless chicken thigh cooked with a special barbeque sauce. Not only is the meat incredibly tender, but it goes so well with that bed of yellow rice that thinking about it now makes me drool just a little. There’s a seductive smoky flavor that comes with grilled meat, too, complemented by Ono’s special barbeque sauce. Then there’s the Ono Hawaiian Burger with cheese sauce, grilled pineapple, crispy bacon, and a thicc slab of hamburger meat. It is a wonderful tower of a burger filled with different colors and taste sensations that complement each other well: the sweetness of the pineapple to the crispiness of the bacon; the warm cheese sauce to the tender, meaty goodness of the hamburger patty. Need I say more? To wash down our meal, we were given glasses of Lychee iced tea, perhaps my favorite variant of iced tea yet. It tastes delicious and refreshing, but the main selling point is really the delicious boba that sits waiting for you at the bottom of your glass. Yes, boba, seemingly the word of the moment (raise your hands if you’re part of that subtle asian memes group). This kind of boba isn’t your ordinary sago. The boba Ono uses is a delightful surprise; it’s one that explodes in your mouth with juice and is aptly named “popping boba”. Try it; you won’t be disappointed. If you aren’t the type of person to enjoy pineapples on pizza, then maybe you aren’t one to want it on a burger, either. Fear not; Ono’s got you covered. Go ahead and order their cheeseburger instead. It’s plain and simple, a no muss, no fuss kind of thing that’s virtually fail-proof. It’s a safe choice, but one that doesn’t get too boring. We were fortunate enough to be able to try both of Ono’s desserts, as well: the bread pudding and cookie s’mores. Just a disclaimer: I don’t really like bread pudding. However, when it’s served a la mode and with a criss-cross of chocolate syrup, then it turns out, bread pudding isn’t so bad after all. The one at Ono has all of that, and it’s great. The bread pudding is moist and warm, which contrasts with the vanilla ice cream that’s served on top of it. It’s a little sweet, but worth every bite. The cookie s’mores were great because it (surprisingly) wasn’t that sweet. The semi-melted marshmallows make it quite sugary (and deliciously gooey), but when you simply focus on the chocolate cookie dough, you’ll notice that it’s actually a little bitter. Not overpoweringly so, but just enough so that eating it with the marshmallows strikes a perfect balance on your palate. It’s been a few months since my trip to Hawaii and sometimes I like to think back to it and remember those times sipping mai tais at Duke’s or taking a dip along Waikiki, tasting Leonard’s hot malasadas and buying poke bowls at Don Quijote. It was a great summer. Eating at Ono takes me back somewhat. And so I end this 10 course meal by saying mahalo to Hawaii for all its wonderful tastes and memories. I’m so glad that you aren’t so far from me anymore.